Whether the occasion is a birthday, Christmas, or Mother's Day, this personalized sweatshirt would be a great gift to give your Mom, Grandma, or Aunt. They dedicate so much time to making their little bundles of joy happy, and this Personalized Grandma Shirts or shirt for Mom celebrates that important role in a sentimental way. This Reasons I Love Design is a wonderful gift for your Grandma, Mom, Aunt or any special lady in your life. It is available on our cotton/poly blend machine washable sweatshirts in adult sizes S-3XL. Free personalization of the # of reasons, any title and up to 15 names is included. 👍😊wish I could have added more names but a wonderful sweatshirt!! Love the pink sweatshirt for a Great Grandma! It had 15 names on this quality sweatshirt! The sizing seems very generous! Additional Details Give this personalized gift to your Mom, Grandma, or your favorite Aunt. They'll appreciate the sentimental and heartfelt message on this sweatshirt, and they'll gladly wear it with pride. 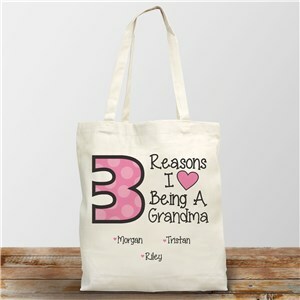 Our Personalized Reasons I Love Tote Bag is another great gift idea for them.